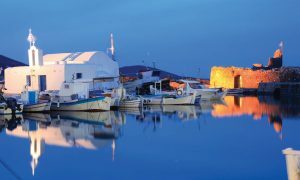 The beautiful island of Paros in Greece is one of the most picturesque islands of the Cyclades. 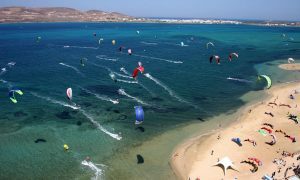 Located in the heart of the Aegean Sea, just opposite the cosmopolitan island of Mykonos, Paros is ideal for everyone. From quiet secluded beaches to the busy nightlife of Naoussa, this island has a bit of everything. The Parian traditional villages, particularly Naoussa, Parikia, Lefkes and Aliki, are the perfect example of traditional Cycladic architecture, whitewashed houses, cosy tavernas and of course the magical ancient churches that can be explored from the narrow streets of the old towns. 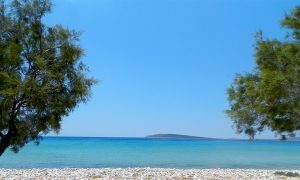 There are so many magnificent beaches to see, from large sandy ones full of summer fun, to small secluded pebble beaches only accessible by foot or boat – all famous for their natural beauty and crystal clear blue waters of the Aegean Sea. 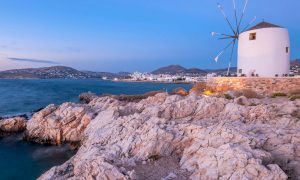 If you wish to explore there are numerous islands nearby accessible by boat, the closest being Anti-Paros with it’s lovely village, sandy beaches, delicious tavernas and even natural caves. The island of Despotiko is also nearby, amazing secluded beaches and ancient monuments to explore. Kite surfing, wind surfing, water-sports, yoga, pilates, scuba diving, horseback riding, walking excursions, hiking, cycling, tennis and even cooking classes just to name a few.